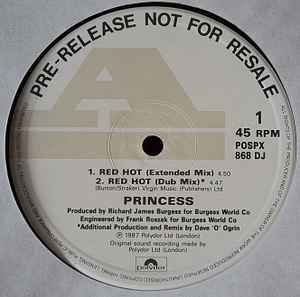 A side vinyl only pressed "Red Hot (Extended Mix)". Label "Red Hot (Extended Mix)" + "Red Hot (Dub Mix)". B side vinyl pressed "Red Hot (Dub Mix)" + "Programmed To Love You". Label "Programmed To Love You".